Are the New iPhones Worthy of all the Hoopla? When news of the new iPhones – the XS Max, XS, and XR – was announced last month, I wasn’t all that excited. Compared with previous years, there didn’t seem to be that much to get excited about and the dial seemed to be turned way down on the hype. Having had the 6 Plus and the 7 Plus models, the first of the larger size iPhones, I knew size would be important to me. The 6 Plus and 7 Plus, although I liked the larger screen size, were just too large for me; put them in a case, especially something like a Mophie case for extended battery life, and it was like carrying a brick! The larger size of the XS Max is somewhere between the size of the iPhone 7 Plus and the smaller iPhone X. That middle ground is the best of both worlds: a larger screen for aging eyes and still small enough to fit in a shirt pocket. Advances in the Portrait feature with depth-of-field control both before and after taking the shot. And let’s not forget the option for 512GB of storage space! (I remember when the 5.25 floppy disk held only 160 KB on each side!) Why is 512 GB attractive? If you’re shooting video or shooting more RAW images which can be huge, this extra space is very useful. Within the first day of using the XS Max, I noticed the improvements in battery life, and I noticed that opening apps and processing images was so much faster than with the X! But, it was the native camera’s Portrait Mode with depth effect that got me excited! The dual lens camera that was first introduced with the iPhone 7 Plus, is, IMHO, the most significant advancement in mobile cameras that we’ve seen in years, and Apple has steadily improved on that original 7 Plus with advancements in the 8 Plus, then the X, and now the XS phones. With the XS and XS Max, it’s taken another step toward higher quality. So, what’s the big deal about the dual lens system? Well, until the introduction of the dual lens cameras, creating a narrow depth of field (where only a select segment of the image, such as a face or a flower, is in focus) was not possible. That desirable look, especially for portraits, was something that could only be done with traditional cameras that allow you to open the aperture. With the introduction of the dual lens system, the iPhone could now focus on a face (or other subject), while creating a beautiful, soft background and foreground (aka, “bokeh”), depending on the focal point. The iPhone X improved on this system making it possible to select various lighting styles when taking the shot and, remarkably, to change the selection after taking the shot. The iPhone XS cameras do all these things, but, they've raised the bar even farther. The XS phones also have the ability not only to create a narrow depth-of-field and make lighting choices, but also to determine how blurry to make the blurred parts of the image. Using a control that simulates the f-stops on a traditional camera, the XS cameras let us choose a wide-open shutter (f/1.4 for a very blurry background), or a smaller aperture (f/16, for an image that is sharp from the foreground through the background). And, if that’s not enough, we can make these changes to the blur after the photo has been made! 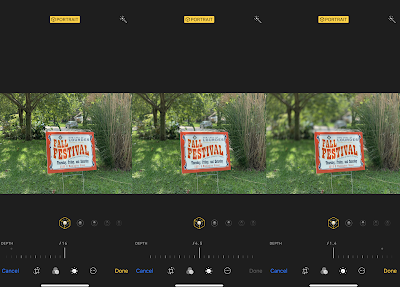 The image below shows three screen shots of a Portrait image being edited on the iPhone XS Max. The image on the left has the f-stop set to f/16 and the entire image, foreground through background, is in focus. The center image has the f-stop set to f/4.5 and the sign is sharp while the background is slightly out of focus. In the image on the right, the f/stop is set to f/1.4 and the sign is sharp while the background is very soft and out of focus. Here's an example using the Portrait feature on an actual portrait. In this case, I chose an f/stop of f/2.8 for a great background blur. And, this feature, although it works great for portraits, is not just for portraits. 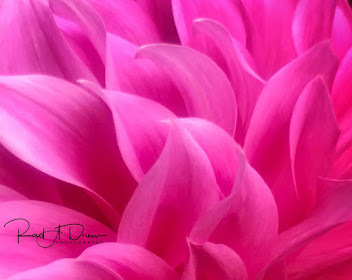 Try it on flowers or other items that you want to isolate in an image. 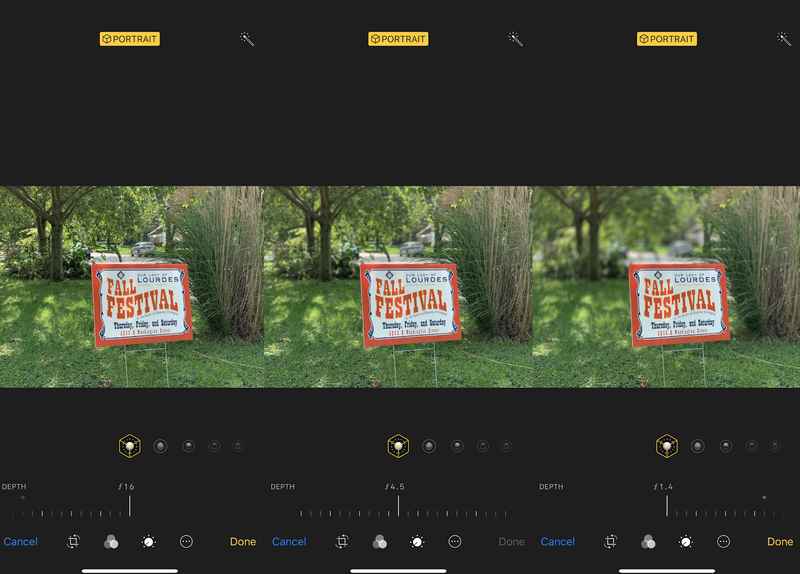 Add to these capabilities one more great feature: Smart HDR, and the iPhone XS phones are looking pretty good! 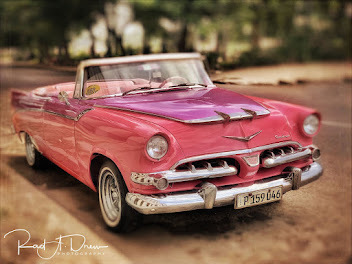 HDR, or “high dynamic range” photography, has been around since the early digital days, but back then it was strictly the domain of the most technical of photographers. 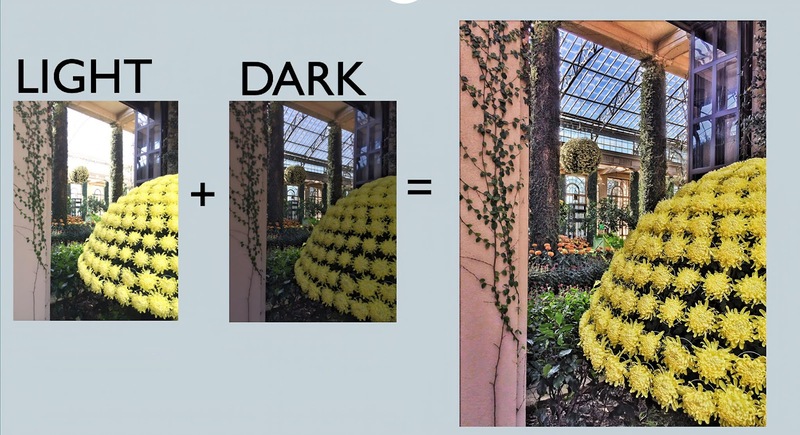 Simply put, it involves taking two or more photos of the exact same scene but with different light readings, then combining these two images for a result with a superior exposure throughout both the shadows and the bright areas of the image. 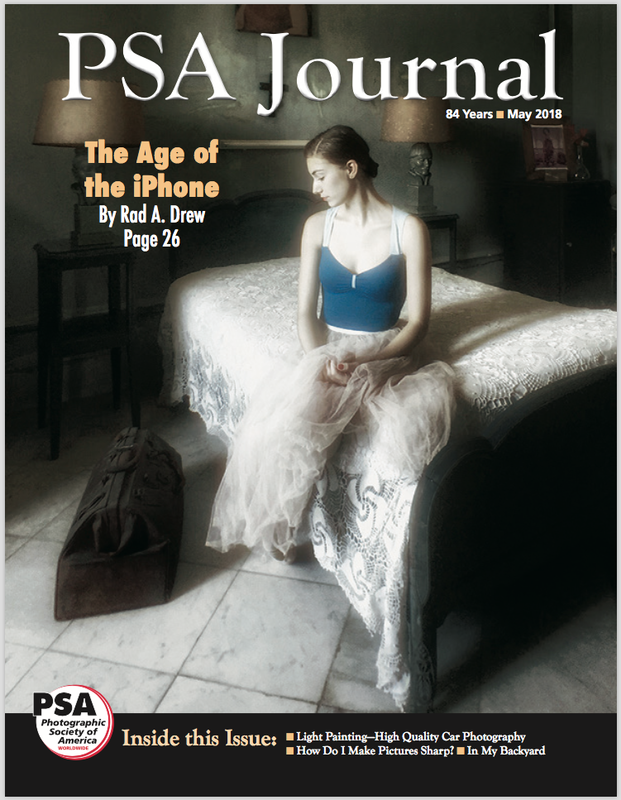 Not long after the introduction of the iPhone, app developers created apps that allowed iPhone users to create HDR images with the click of a button. 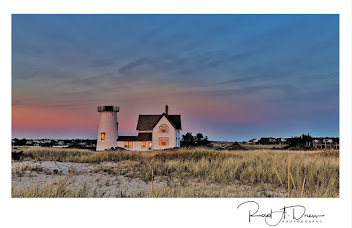 HDR was no longer difficult or complicated, and thus, became a common way for everyone to create a very well exposed image even when there are very bright and very dark areas in the scene. The two examples below show the fundamental concept of HDR. There are two images, one taken so the light areas are well exposed and the shadows are too dark, and another where the shadows are well exposed but the bright areas are too bright or “blown out.” The third image in each group shows what happens when the two images are combined, resulting in the best exposure for both bright and dark areas in one image. The image on the left has no detail in the bright area outside the greenhouse, while the flowers are nicely exposed. The second image is exposed well for the blue sky outside the greenhouse, but the flowers in the foreground are too dark. 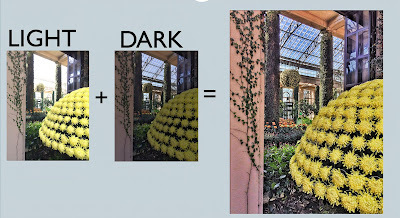 The image on the right is the result of combining the two previous images, producing a well exposed image with the highlights recovered and more detail in the flowers and in the shadow areas. 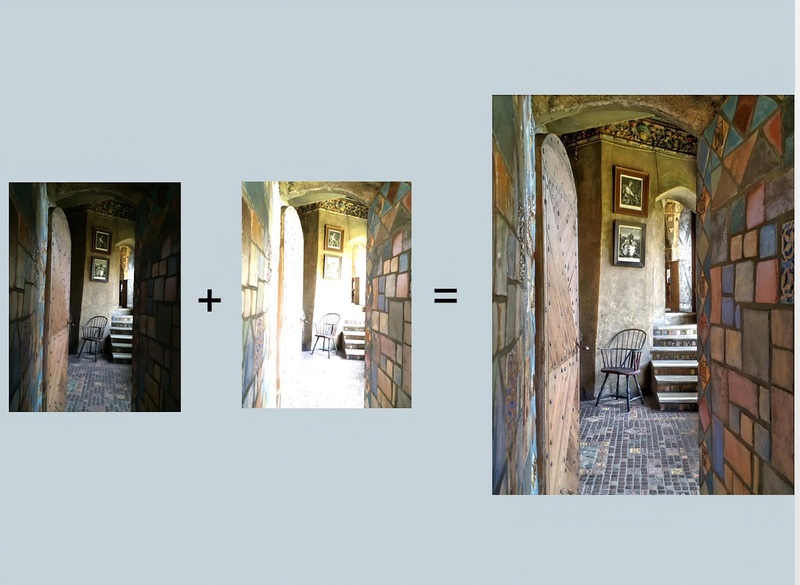 The image on the left is exposed well for the bright area at the end of the hallway, but the wall on the right is in shadow. The second image is exposed well for the colorful tile walls, but the area at the end of the hallway is too bright and lacks detail. 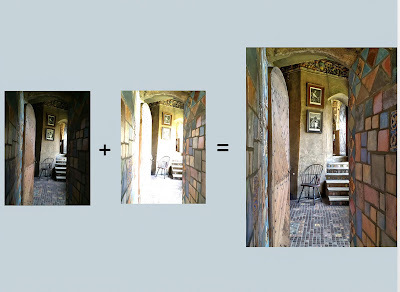 The image on the right is the result of combining the two previous images, producing a well exposed image with the highlights recovered and more detail at the end of the hall, and in the shadow areas. All this today is known as “computational photography,” and as phones have become more technologically advanced and their computing power enhanced, they now have the ability to perform trillions (that’s not a typo!) of computations to create the final image. Smart HDR takes advantage of this computing power made possible by the new A12 Bionic processor to create remarkable HDR images. Where it really struts its stuff, is when making an image of a moving subject in a high-contrast scene. With past HDR, shooting moving subjects often created ghosting or blur because there’s movement between the shots. With this high-tech computing power, the camera is able to eliminate shutter lag and freeze motion even while producing an HDR result without shadow or blur. The images of the skateboarders below are sharp with no motion blur and they are both in mid-air or in motion, moving very fast. I'm looking forward to using Smart HDR more, but from what I can see with these shots, it does great job and is markedly improved over the iPhone X.
I’ve really enjoyed these enhancements offered in the new XS iPhones, and the larger size of the iPhone XS Max has been a great choice for me. All that said, this may be a good time to remind ourselves that the creative side of photography is not about the camera. We don’t need the latest and best to continue to do creative work. And, I think, regardless which camera you use today, they are all so close in what they can do that much of what we choose boils down to personal preference. If you’re not ready to make the commitment to one of the new XS phones, and you currently have one of the other dual lens phones like the 7 Plus, 8 Plus, or X, you’ll be interested to know that you can achieve some of the same depth-of-field results with software available in the app Focos. 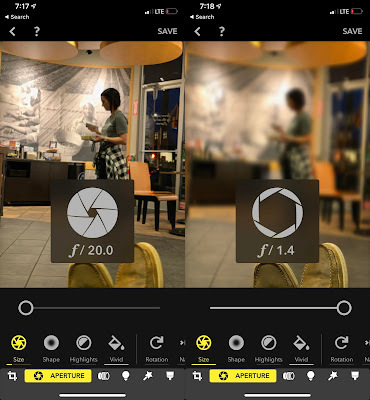 This remarkable app will use your dual lens cameras to capture images, then allows for some of the same depth-of-field and blur adjustment found on the XS iPhones. Here’s an example of what is possible. See the screen shots of the Focos interface below. The image on the left shows the image with the f/stop set to f/20. Notice that the entire image from the shoes in the foreground to the wall in the background is in focus. The image on the right has the f-stop dialed to f/1.4. In this image, the shoes in the foreground are sharp, while the background is quite blurred. Furthermore, you can reassign a focal point in the edit mode by tapping anywhere on the screen, even after taking the shot. Focos also shows the image in 3D and provides additional depth filters. 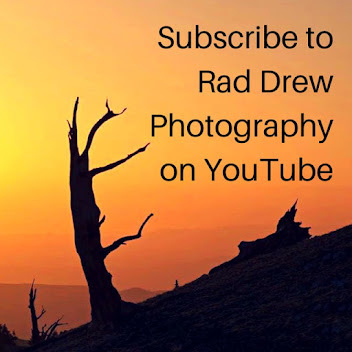 Watch for a tutorial on this great app in a future Rad Drew Photography Newsletter! Whether you’re ready for an upgrade, or choose to continue to shoot within the limitations of your current tools, remember: It’s not about the camera! The most important part of any camera is that loose nut behind the lens! Whether upgrading or staying with what you have, there are options that let you explore some new ways to make photographs. The iPhone 4 in 2010 was my first smart phone and I didn’t even know it had a camera in it until after buying it. Since that first phone, I’ve shot with nearly every iPhone made. Today, the flagship phones from all the top developers are all extremely good and the differences are often so minuscule that it’s not valid to claim one is “better” than the other – although we often hear those claims. Today’s phones are essentially different in ways that make us choose what we like and there’s nothing wrong with that. My choice of iPhone is not necessarily because I believe it is better than its competitors. I don’t! I’ve had the opportunity to shoot with the Samsung S9 and the Google Pixel, and I find them both to have extraordinary cameras. So why do I stick with and continue to advocate for the iPhone as a mobile camera choice? Some might argue that it’s because of the familiarity I now have with it after eight years of iPhones, and there’s probably some truth to that. But, the main reason I’ve stayed with the iPhone is because of the number and quality of post-processing apps and camera apps available for it that simply aren’t available for android phones. That is changing, and rapidly. Today we have camera apps like Lightroom CC that allow us to shoot and process RAW files on both iPhone and android, and we have the powerful editing apps, SnapSeed and PS Express, both of which offer great editing and stylizing options, and run on both platforms. There will come a time when the available tools for each operating system will either be the same or the differences simply will not matter anymore. Until that time, though, I’ll likely stick with the iPhone. I’m very happy with it and the tools available. 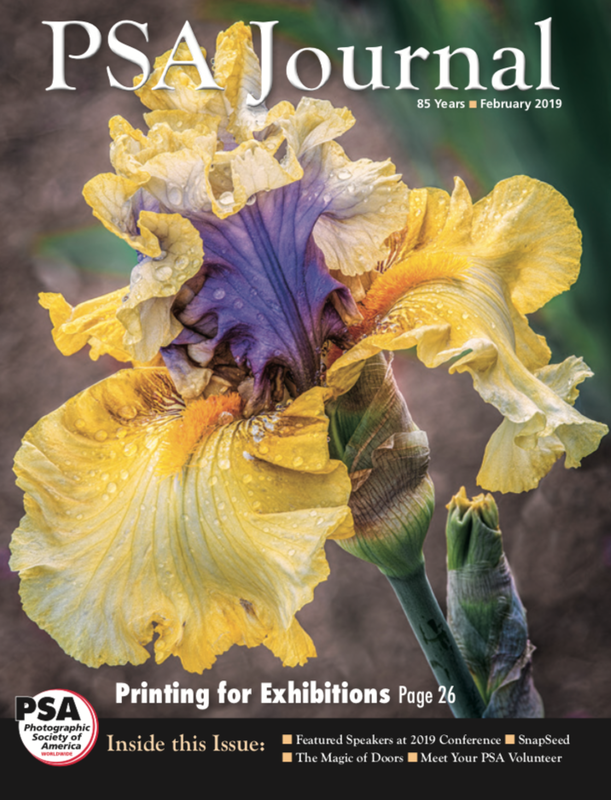 If you’re an android user, you might appreciate my article in Luminous Landscape, Favorite Mobile Photography Apps that Run on Both iPhone and Android Devices. Thanks for reading and until next time, keep on shooting!